Almost as soon as my wife and I closed on our new house, and way before we’d gotten the first batch of boxes unpacked, the marketing powers that be caught wind of our move. Offers to refinance our mortgage? Check. Offers to protect children against the evils of lead and radon? Check. The majority of these mailers promptly found their way to the bottom of our recycling bin. But one mailing caught my eye. It touted the financial and ecological benefits of a subscription to something called a community solar garden. Eventually, a salesperson showed up at our doorstep and walked us through how much we could expect to save on electricity without paying to install unsightly solar panels on my roof. But I was still skeptical. Could a community solar garden be right for you? Here’s everything you need to know about the economic and environmental potential of crowdsourced solar power – and its potential pitfalls too. The community solar garden is a relatively new approach to solar power generation. A community solar garden is a privately owned solar panel array on a dedicated site, such as a marginal field not suitable or profitable for agriculture or a flat-roofed warehouse or factory. Some gardens are owned by cooperatives comprised of like-minded individuals. Most are directly owned by major utility companies or third-party operators, such as Denver-based SunShare Community Solar and Minneapolis-based MN Community Solar. During daylight hours, the array feeds the power it produces into the local electric grid. Each community solar garden subscriber is assigned a share of the array’s power production, based on their household’s average energy usage. Except in true cooperatives, which aren’t very common, users (typically known as “subscribers”) don’t legally own the panels responsible for producing their share. Nor do they directly use “their” power, as their panels aren’t directly connected to their home. However, thanks to the magic of “net metering,” they do benefit financially from the arrangement – at least, under the right circumstances. In a nutshell, net metering allows you to pay your utility according to your net electricity consumption. Consumption values are usually expressed in kilowatt-hours: kilowatts of power consumed over an hour. When you put a solar array on your roof and hook it up to your home’s electrical system, you create a direct, unbroken link between the sun’s energy and your home’s appliances. With enough battery storage or miserly after-dark electricity usage, you can get by with little to no help from the conventional utility grid – in other words, producing most or all of the power your home needs. You only pay your utility for what you draw from the grid. In the context of community solar gardens, which don’t require you to put a solar array on your roof, net metering is technically known as “virtual net metering,” since you’re not directly producing the power to be fed back into the grid. Net Metering: Good or Bad for Utilities? Under the traditional utility model, net metering lowers utility providers’ revenues by reducing consumers’ power demand (and shrinking their monthly power bills). Obviously, this is great for consumers’ bottom lines, but not so great for utilities’ shareholders. The upshot for utilities: Net metering reduces electricity demand during periods of peak demand – for instance, blazing hot days when the sun is shining brightly and solar panels are generating electricity at peak efficiency. This, in turn, reduces stress on the United States’ creaky electric grid, lowering the probability of brownouts, blackouts, and infrastructure damage. Until recently, solar power was a marginal technology, and utilities’ net metering losses were manageable. As renewables grow more cost-competitive with fossil fuels and more retail consumers take advantage of private solar generation opportunities, the calculus changes. Many utilities are actively lobbying state legislators and executives to curtail net metering, while others aim to take ownership of the infrastructure that makes net metering possible – namely, solar power arrays – even in cloudy, high-latitude regions where the sorts of large-scale solar power plants that now dot the sunny southwestern U.S. and Mediterranean coast aren’t yet commonplace. For now, and with the caveat that the regulatory framework is always subject to change, net metering remains within reach for most U.S. electricity consumers. 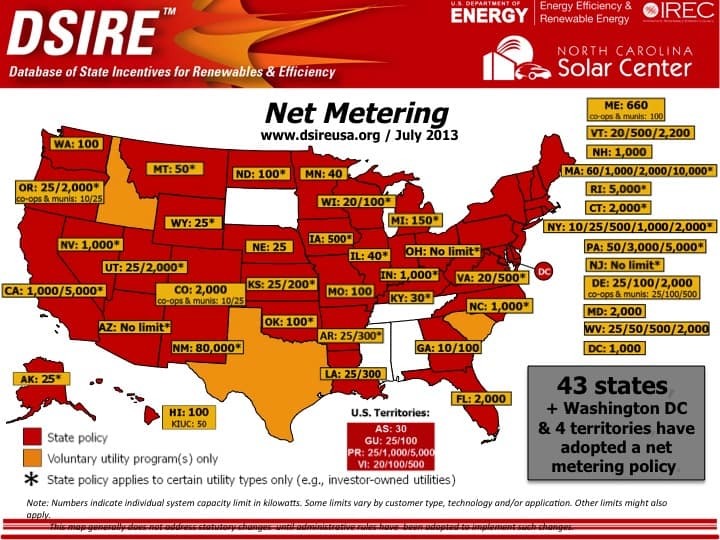 According to the Database of State Incentives for Renewables & Efficiency, 43 states, the District of Columbia, and four U.S. territories allow some measure of net metering. In most jurisdictions, utilities are required by law to adhere to net metering statutes. In a handful, including Texas, net metering is voluntary. Limits to the permitted size of individual solar generation systems – basically, the size of the system or share an individual can use to offset their draw on the power grid – vary widely by state: from 40 kilowatts in Illinois and Minnesota to no limit in Ohio and Arizona. If solar power were free to generate, net metering would be wildly profitable for consumers (and ruinous for utilities), and everyone would have their own home solar arrays or community solar garden subscriptions. Though it uses a readily available and functionally limitless energy source that bathes half the planet at any given time, rather than dirty concentrates that have been locked underground for millions of years and require massive amounts of resources to extract, solar power is not free. Not even close. If you want to add solar panels to your roof, you need to make a hefty up-front investment to purchase and install them or enter into a lengthy equipment lease and power purchasing agreement (PPA) with your utility. In either case, you need to budget for ongoing system maintenance. According to Solar Power Authority, a private solar system sufficient to power an average-sized home costs between $25,000 and $35,000, before state, local, or federal tax incentives or utility rebates. Depending on the system’s efficiency and your home’s power consumption, it can take anywhere from 10 to 30 years to break even on that investment through lower power bills. Though some community solar garden providers charge onboarding fees in the low three-figure range, solar garden subscriptions generally follow a pay-as-you-go model. Subscribers pay for power monthly, as it’s produced, distributed, and consumed. They, therefore, don’t have to make five-figure up-front investments to get up and running, unlike home-based solar generation system owners who finance out of pocket. Once they sign up, they begin saving almost immediately. Some solar garden operators offer up-front or partial up-front payment options. Under the former, the subscriber pays for their entire projected electricity use over the length of the contract, usually at a set rate per kilowatt-hour. Under the latter, the subscriber pays a flat fee that may or may not be directly tied to projected electricity consumption over a set period – say, three or five years. In both cases, the operator may offer a discount to prevailing kilowatt-hour rates – for instance, $0.11 per kilowatt-hour, rather than a market rate of $0.013 per kilowatt-hour. Still, these models impose substantial up-front costs on new subscribers. 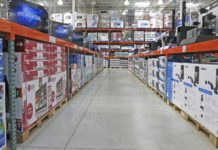 For full up-front customers, those costs can easily reach into five-figure territory. Meanwhile, time to breakeven lengthens dramatically, often beyond the 10-year mark. Up-front and partial up-front payments do pay off on the back end of the contract, via greater savings relative to the sans-solar baseline and lower total costs over the life of the contract. For simplicity’s sake, the following savings example (and most of the rest of this post) will focus on the pay-as-you-go model, which is by far the most commonly chosen community solar garden payment model – not to mention the most accessible for subscribers with limited personal savings and modest incomes. How do solar garden subscribers save on their utility bills? First, their shares generate power and feed it into the local utility grid. The local utility with which the garden operator contracts pays the operator for that power, usually at a higher rate than the subscriber pays the operator. For instance, in my area, third-party garden operators typically charge subscribers about $0.12 per kilowatt-hour and the local utility (XCel Energy) about $0.14 per kilowatt-hour. The garden tracks each subscriber’s production, and the utility credits their consumption at the higher kilowatt-hour rate – reducing their utility bill by their production in kilowatts times the utility’s kilowatt-hour rate for purchased power. As long as the power produced by the solar garden costs less than the power purchased by the utility, the subscriber saves money. Here’s a real-world example. Say your home consumes about 900 kilowatt-hours per month, close to the U.S. household average as of 2015 (per the U.S. Energy Information Administration). At present, you pay your utility $0.16 per kilowatt-hour, for a total monthly power bill of $144. You then buy a community solar garden share that, once operational, produces 300 kilowatt-hours per month at $0.13 per kilowatt-hour. You pay the garden operator $39 for that power, plus $96 to your utility for the remaining 600 kilowatt-hours of conventional power. Your total monthly electricity cost, split between two bills, is $135 – a savings of $9 per month. That’s not a dramatic cut, but it can certainly add up over time: $108 per year, $1,008 per decade, and $2,700 after 25 years. Of course, these projections assume constant rates, which aren’t a given. Some solar garden operators offer fixed rates over the life of their contracts. However, it’s more common for operators to plan scheduled rate hikes over long periods (typically 10 years) that mirror or undercut projected utility rate increases, maintaining ample separation between the two schedules. The model’s long-term sustainability relies on this separation, so it’s vulnerable to unexpected utility rate drops or unexpected increases in the cost of garden-produced solar power. This example assumes you’re working with a third-party solar garden operator and receiving two bills – one from the operator and one from your utility. Some utilities have entered the solar garden business themselves, effectively cutting out the third-party middle man. In certain states, such as Colorado, they’ve hashed out favorable regulatory terms. For instance, the Denver Post reported on a 2016 agreement that allowed Xcel Energy to build gardens as large as 50 megawatts, compared with two megawatts for third-party farms. With greater economies of scale, Xcel can charge customers a lot less – up to 40% less, according to competitor SunShare’s estimates. Even if they’re not significantly cheaper, utility-operated solar gardens are simpler for subscribers, since the power produced by each share is automatically deducted from the subscriber’s utility bill. There’s, therefore, no double-bill situation. Solar garden contracts are unwieldy documents that outline numerous caveats and obligations for subscribers. To make matters worse, third-party garden operators aren’t always transparent about the contents of these contracts. It’s hard to find reliable, detailed information about their terms online. It’s therefore extremely important to read your contract’s fine print (and resist sales pressure, an unfortunate by-product of the lightly regulated solar garden market) before signing. Length of Term: Most contracts last 20 to 25 years. This reduces subscriber churn and improves the accuracy of operators’ long-term financial projections, a key consideration for gardens financed by bank loans (as most are, at least in part). Without a long contract term, the solar garden model would be much shakier. But 20 to 25 years is a long time for most subscribers to commit to a contract, particularly renters and frequent job-changers who expect to move before their time is up. Credit Score Requirements: To reduce delinquency risk, many third-party solar garden operators hold subscribers to strict credit score requirements – often a FICO minimum of 680 to 700. Add “inability to qualify for a solar garden subscription” to the ever-growing list of downsides of poor credit. Lock-In Period: Some solar garden contracts include yet another lender-friendly requirement: lock-in clauses that prohibit cancellation within a fixed period following sign-up. These lock-in periods can be long: MN Community Solar, an operator in my area, locks new subscribers down for six years. It may be possible to break this clause through legal action or a negotiated settlement with the operator, but don’t count on it (and that’s likely to be costly anyway). Minimum Subscription Size: Most operators require subscribers to pay for a minimum subscription size, usually expressed in kilowatts or dollars. Minimums can sometimes be quite manageable – say, the equivalent of $10 or $15 per month – but watch out for larger minimums. Maximum Share Limits: A subscriber’s net benefit is generally capped at 120% of their total electricity consumption. For instance, if your home consumes 1,000 kilowatt-hours per month and your solar garden share produces 1,500 kilowatt-hours per month, you can only offset your consumption up to 1,200 kilowatt-hours. You still come out ahead on the deal, but you’re not getting rich off it. This limit reduces the distorting effects of net metering. Geographical Requirements: Community solar gardens are highly localized. Individual gardens often serve residents of a single county or a handful of sparsely populated counties. If you move out of the territory, you must forfeit or transfer your subscription – possibly at a hefty cost. Transfer Requirements and Fees: If you need to transfer or terminate your subscription, you may have to pay for the privilege. Transfer fees (for transferring your subscription to another subscriber without interruption) typically range from $100 to $300 per event. You may also need to find another willing subscriber, meaning you’ll have to lean on friends or coworkers who live in the territory. Some solar garden operators waive fees for subscribers who die or move out of the area, but that’s not a sure thing. Early Termination Fees: If you decide to walk away from your contract for any reason other than an out-of-area move or your own death, you may trigger your contract’s arbitrary exit clause. This can set you up for a hefty early termination fee – sometimes well into four-figure territory. Early termination fees are often calculated as a prorated percentage of future savings – for instance, if you cancel with 10 years left on your contract, you’ll pay more than if you cancel with five years left on your contract. Solar garden operators generally keep arbitrary exit fees lower than the total projected balance left on the agreement, but they can still add up to thousands of dollars. Scheduled Rate Increases: Community solar garden contracts generally spell out scheduled rate increases (sometimes known as step-ups) that determine your per-kilowatt-hour costs in future years. These are generally tied to projected utility rate increases, but they’re locked in regardless. If utility rates increase faster than expected, you’ll save more. If utility rate increases lag projections, your savings will lag too. If you live in an area with lots of community solar gardens, look for utilities or operators that promise guaranteed savings – for instance, many set a “savings floor” at 9% or 10%, relative to what you’d pay for “regular” power from your utility. These aren’t the only contract terms that give new solar garden subscribers pause. And there are plenty of other issues that your contract may not spell out in detail, like your recourse (if any) if your solar garden goes offline due to a severe weather event or infrastructure failure. Again, I can’t stress enough the importance of carefully reading your contract’s fine print and fully understanding the potential for inconvenience and hidden costs. If you’re at all unsure about the implications of what you’re signing, run it by a legal professional. This could cost a few hundred dollars up front, but your out-year savings should pay for it. If it prevents a poor decision that would cost you thousands after an unexpected move or system breakdown, all the better. If you’re interested in a community solar garden subscription but haven’t been inundated with mailers or visited by door-to-door salespeople, you need to figure out whether community solar gardens exist in your area – and whether they’re permitted by law. Not all states allow community solar gardens. According to the Solar Energy Industries Association, a trade group, 25 states have at least one community solar project online or under construction. That means more than a dozen states that do allow net metering don’t have solar gardens. Some community solar gardens are quite small, capable of powering a relative handful of homes and businesses, while others are quite large. As of early 2016, over 100 megawatts of solar garden capacity has been installed in the United States – enough to power at least 20,000 average-sized homes. State community solar garden regulations weave a confusing patchwork. Some state laws are much more restrictive than others. As of early 2017, the most permissive states are California, Colorado, Minnesota, and Massachusetts. According to the SEIA, those four states will account for the lion’s share of near-term solar garden development. If you live in one of those states, there’s a good chance you have access to at least one community solar project. For detailed, up-to-date information about your state’s rules and regulations regarding solar gardens, check with your public utility commission. A quick online search that includes your home city or county and terms like “community solar gardens” or “solar garden share” should uncover reputable operators in your immediate area. Not sure whether a community solar garden subscription or home-based solar array is right for you? These are some common arguments for and against each. Available to Renters. Unless you have a laid-back landlord or don’t care about recovering your security deposit, you can’t install solar panels on a rented house or apartment building. That’s not an issue with most solar garden operators – as long as you can prove you live at your address, you can subscribe. Property’s Solar Rating Is Irrelevant. Do you know your property’s sun score (or sun number)? It’s a simplified measure of your property’s suitability for on-site solar power generation, based on average daily hours of sunlight, shade profile, and other factors. If your property has heavy tree cover or happens to be in the shadow of a building or mountain, its sun score may be too low for practical solar power generation. As a solar garden subscriber, your own property’s sun score is irrelevant – as long as the sun shines reliably on your garden, it’ll work for you. Much Lower Up-Front Investment. Solar garden subscriptions don’t require massive up-front investment. If you do have to pay anything out of pocket to set up your subscription, it’s likely to be more manageable – perhaps a $100 one-time fee. Contrast that with the five-figure cost of an on-site array capable of generating most or all of your home’s power. Even if you reduce your outlay with energy efficiency tax credits and finance the rest with a low APR credit card or home equity loan, you’ll be saddled with the financial burden for years to come. Faster Payoff. That financial burden means you’ll need to wait years, perhaps decades, to realize the financial benefit of your on-site solar power system. With a solar garden subscription, you start saving much faster – almost immediately with no activation fee, and within a year or two with a $100 to $200 up-front outlay. No On-Site Installation Requirements. Solar garden subscriptions don’t take up space on your property. Even rooftop arrays can negatively impact your property’s aesthetic profile and impede views. Ground-based systems, which may be preferable on large, rural lots, actively shrink your property’s usable square footage. No Physical Equipment or Infrastructure. As a solar garden subscriber, you don’t have to deal with physical equipment or infrastructure of your own. All upkeep, repairs, and installations are handled by trained professionals and overseen by your utility or third-party operator. And you don’t have to worry about your very expensive solar array adding to the cost of your homeowners insurance policy either. No Technical Expertise or Support Required. Since you don’t have any physical equipment or infrastructure to maintain, you don’t have to worry about troubleshooting your panels or wiring when things go awry. If you lease a home-based solar power system from a utility or developer, you don’t need extensive technical expertise either, but you still need to know enough to diagnose potential problems. Often Requires Good to Excellent Credit. Most solar garden operators hold subscribers to surprisingly strict credit standards. If your FICO score is under 680, you may struggle to land a contract. Some operators partner with faith organizations, nonprofits, and social enterprises to offer subscriptions to people in the process of rebuilding their credit – for instance, a 2015 Minneapolis Star-Tribune article featured a Minnesota solar garden partnership specifically designed for credit-challenged subscribers. But such options are not guaranteed to be available in your area. Complicated Contracts and Cost Structure. If you finance its purchase and installation out of pocket or with a loan in your name, the legal aspects of owning and operating your own home-based solar array are significantly simpler than a solar garden subscription. (If you lease your home generation equipment from a utility or other organization, that’s another matter. You’ll need to enter into a power purchase agreement (PPA), the same framework that binds community solar garden operators and utilities. PPAs also have long terms – 10 to 25 years.) As discussed above, community solar garden contracts are complex and often confusing, with potentially hefty arbitrary exit fees, lock-in periods, minimum share sizes, and other restrictions. Fewer (If Any) Opportunities for Favorable Tax Treatment. The solar garden boom is at least partly attributable to a slew of generous green energy tax credits designed to spur solar energy development. Issued to solar garden developers and other commercial entities that install solar power capacity, these credits render many marginal solar garden projects viable. Unfortunately, individual solar garden subscribers can’t take direct advantage of them. Meanwhile, the federal government offers generous tax credits (30% of equipment and installation costs through 2019, per Intuit) to homeowners who install solar generation capacity at their primary residence. Limits and restrictions apply, so consult your tax advisor. Projected Savings May Not Materialize. Some community solar garden operators guarantee minimum cost savings relative to subscribers’ sans-solar baseline bills. Others don’t. If your contract doesn’t specify minimum savings, you’re vulnerable to pricing changes that may reduce or eliminate your savings. In early 2016, Minnesota Public Radio reported on some early solar garden subscribers facing this reality. Some regretted their decisions to subscribe, which were based on dubious operator claims and sketchy marketing practices that subsequently caught local consumer protection authorities’ attention. Geographical Restrictions. If you move out of your community solar garden’s territory, you can’t take your subscription with you. At minimum, that means you’ll need to find someone to take over your contract. You may also need to pay a transfer fee, typically in the low three figures – enough to offset multiple months, and perhaps years, of savings. Higher Out-Year Costs (Lower Savings). Community solar gardens’ early cash flow advantage lessens and eventually disappears over time. By the end of your contract, you’ll likely be worse off financially than fellow homeowners who ate the hefty upfront expense of home-based arrays and now, years later, enjoy ultra-low- or no-cost power. No Actual Control Over Operations and Output. As a solar garden subscriber, you don’t have any control over your share’s production and output. If a natural disaster or system failure knocks your garden offline, your share of production goes to zero until it’s back up and running. Comparable problems can affect home-based arrays too, but you can at least take direct recourse by calling in a technician or fixing the problem yourself. Potentially High Termination Costs. Community solar garden contracts can impose ruinous termination fees, especially for newer subscribers. By contrast, you can unhook your home-based solar array at any time with no out-of-pocket cost, though it’s in your best financial interest to wait until you’ve broken even on the investment. Doesn’t Increase Self-Sufficiency. Your solar garden subscription is a boon for the environment and your bottom line, but it doesn’t render your household any less dependent on the traditional electric grid. Your home remains hooked up to the grid, and, unless you have a diesel generator or other redundant power system on your property, draws all its electricity therefrom. If you’re concerned about the security or sustainability of our public utility system, or you’re keen on living off the grid for any other reason, a home-based solar array is the way to go. As the pace of technological innovation accelerates, business leaders are more concerned than ever about future-proofing – building incremental or wholesale improvements into existing technologies to forestall premature obsolescence. In the solar industry, future-proofing is a huge issue. Individual solar panels can operate near peak rated efficiency for two to three decades, which is great for array owners looking to avoid frequent capital outlays for major repairs or panel replacements. But solar panel technology is improving at a much faster clip. By the time today’s panels start showing their age and requiring major upkeep to remain productive, they’ll have been functionally obsolete for years. This is a problem for community solar gardens and private arrays alike. In the solar business, the only way to truly future-proof one’s investment is to swap out old panels as newer, more efficient alternatives become available. Over the longer term, perhaps beyond the 20-to-25-year terms of today’s community solar garden contracts, breakthroughs may render solar panels obsolete altogether. In short, reality has a way of upending even the best-laid plans. If you’re worried about your private solar array or community solar garden turning into a boondoggle five or 10 years down the road, perhaps it’s best to forgo direct or indirect investment in solar arrays altogether and use the funds (and energy) you’ll save to lobby your local utilities to adopt sustainable power-generation practices – and your elected officials to pass legislation and regulation that compels them to be better environmental stewards. Do you have access to a community solar garden?